My brother, Erik (from ELF Industrial, Otion and The Soap King blog), designed 2 massage soap molds: The Round Massage Mold and the Oval Massage Mold. They have been a huge hit so far so I thought I would do a last minute 4th of July project with them. This project literally took me 10 minutes, it couldn’t have been easier. Give it a try! Grab everything you need for this project by clicking HERE! ONE: Melt 1 ounce of white melt and pour in the microwave and use a dropper to fill in the dots. Let cool for about 5 minutes. TWO: Melt 11 ounces of clear soap base in the microwave and add .25 ounces of your favorite summertime fragrance oil (I used Coconut Citrus Sorbet). Mix well and separate the soap into two separate containers. Color one container of melted soap with Liquid Blue and the other with Perfect Red Color Block. Mix both colors well. 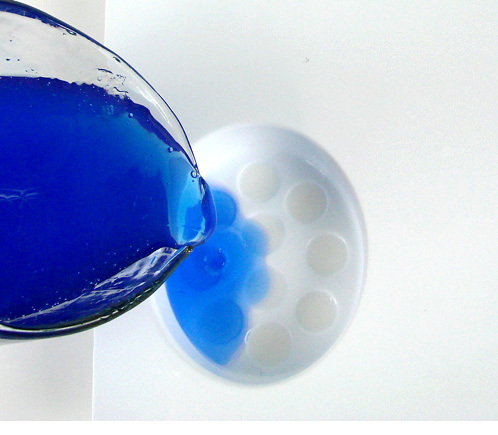 THREE: Once the melted blue soap has cooled to 125 degrees, spray the first layer of white soap with rubbing alcohol and fill up two cavities with the blue soap. Spritz with the rubbing alcohol to get rid of any air bubbles and repeat with the melted red soap. Let cool for 4-6 hours. Try different variations using the Round Massage Mold with different layers and fragrances. 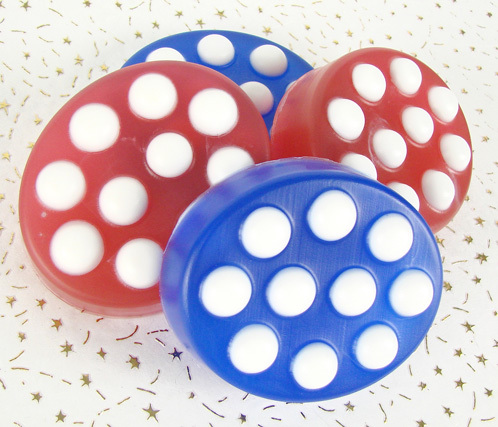 And be sure to check out other Red, White and Blue Projects: Embedded Stars, Solid Bath Sugar Cubes, Pinwheels, American Flag Soap, President’s Day Soap. Super cute color scheme – I agree. I’m so glad you like the project (it was super easy)! And congrats on the potential wholesale orders. That’s exciting news! P.S. Keep me posted on Delivering Happiness, I’m sure you’re going to love it. I’m so glad the flagcolors of The Netherlands are also Red, white and blue!!! I love this mold. ps: thank you for the coupon and I will buy Delivering Happiness as a treat for myself. Had my first ‘ soap’ market today. Sales trough the roof and 3 possible wholesales lead!! How could something so simple also be so cute? Great job Erik. All hail the Soap King! LOL!